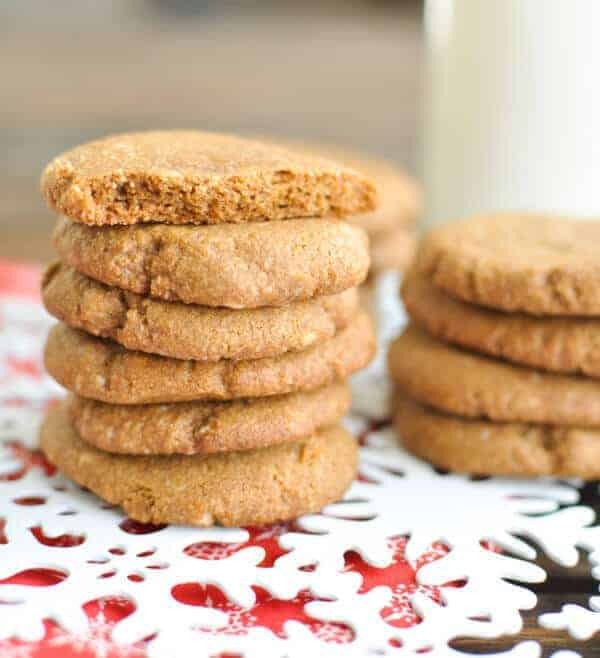 Make these Paleo gingersnaps and throw out all the Paleo Christmas cookies that break your teeth. These are so easy with only 6 ingredients and they are so soft too! Plus, I love that they are so healthy. I dare you to let one of your non-Paleo friends eat one of these and see if they like them. I bet they will. . . .
It’s December, so guess what is on my mind…cookies. Alright alright, I have a bazillion other things on my mind as well – December sure is a crazy month…but cookies are at the top of the list, I have to get my priorities in line – right? December and Christmas just wouldn’t be the same without ginger everything. 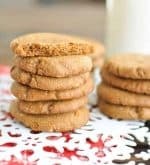 Spoiler alert, I LOVE ginger baked goods and this is a recipe for some insanely delicious soft Paleo gingersnaps. My love for ginger baked goods is a relatively new thing. I didn’t care for it as a kid, but as I got older, wiser, and my taste buds matured, I have learned to love the ginger flavor with the slightest kick of spice. It is just so dang tasty…plus it makes your house smell so GOOD when you are baking! However, my love for ginger stops when I bite into a cookie that almost cracks my teeth. I have never been a fan of hard cookies (with the exception of biscotti), and ginger is no exception. Which is why I insist on making soft gingersnaps. 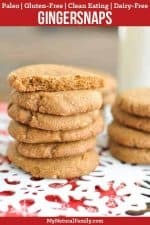 They still have the delicious ginger and spice flavors, but are soft and chewy to eat…perfect! If you don’t already store your almond flour in the freezer, consider doing so. It makes it last way longer. The arrowroot powder really helps make them soft and gives them a light texture. If you don’t do Paleo, you could sub with cornstarch or other similar starches and it will probably work out just fine. I use a cookie scoop to get even sizes of cookies. It looks so much prettier when they are all the same size. Plus, it’s good with children so they can’t say someone else’s cookie is bigger than theirs. Plus, they cook more uniformly too. I haven’t tried to freeze these myself. Cookies around here never last that long. So if you try it, will you please comment below so other people will do if they work. I would guess that they should work great. The only problem is being patient will they unthaw for a bit. I think these will be the cookies that will be left out for Santa this year. I KNOW he will LOVE them! They are made with high protein almond flour, no refined sugar, and are super simple to make. Santa will be very pleased when he comes to our house :). I would love to know if you try these cookies and what you think of them? Are you like me and like soft cookies? Please comment below. 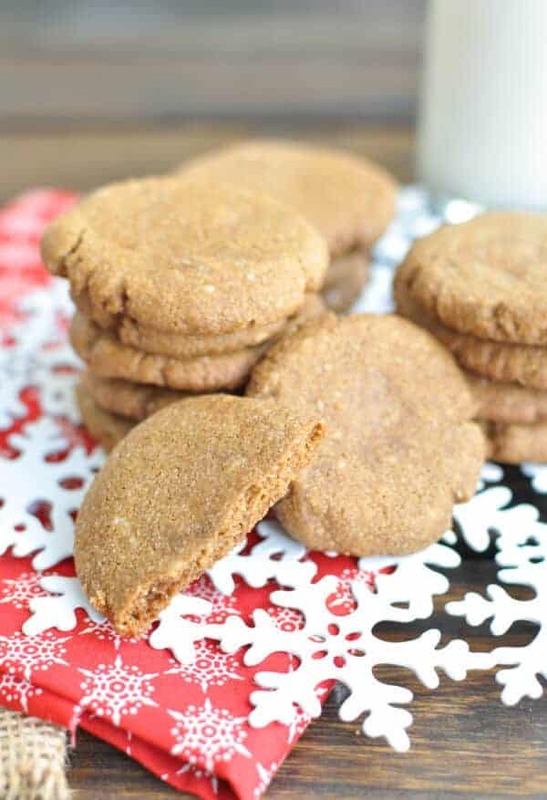 These Paleo gingersnaps are so soft, which is very unusual for Paleo Christmas cookies. Plus, they only have 6 ingredients! Bonus – they are Gluten-Free, Clean Eating, Dairy-Free and Vegan too! 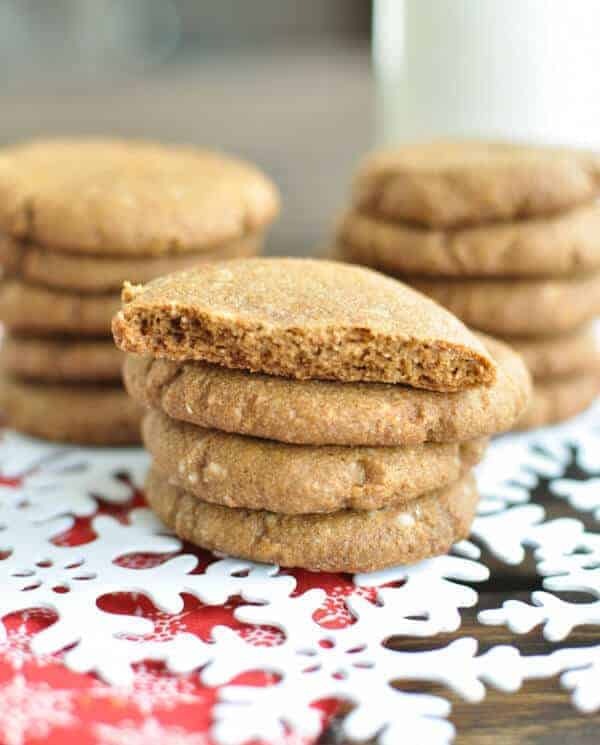 I love gingersnap cookies and Paleo gingersnap cookies are even better. You’re welcome. I’m glad you like them! Thanks for commenting. Ginger snap, that is. Not gingerbread.